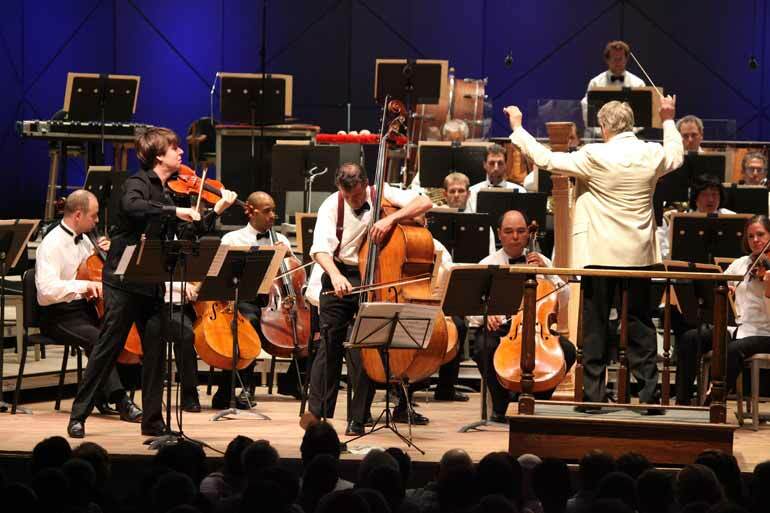 Saturday night the Boston Symphony Orchestra in Tanglewood’s Koussevitsky Music Shed welcomed the conductor Michael Stern and premièred the new Double Concerto for Bass and Violin by Edgar Meyer in the Evelyn and Samuel Lourie Memorial Concert. It was a thrilling evening in Lee. The orchestra opened with Samuel Barber’s Overture to The School for Scandal (1931). This concert music evokes Sheridan’s 18th-century comedy, rendering the wit and gossip of the drama into musical language. Marc Mandel, in the program notes, finds the opening of the Overture to be sardonic; I found it more mannered, as befits Sheridan. The orchestra responded to Stern’s direction and presented well the shifting and fragmentary themes with their varied characters and voices. Quieter dynamics were well represented, if sometimes hard to hear for the ambient noise. The fanfares and chattering interruptions from woodwinds and brass carried well. I was struck by the programming choice: this Overture, like the play inspiring it, is very much a work of interiors – salons, drawing rooms, domestic spaces – was here moved to an exterior venue. The music made sense in terms of the program as a whole, but did seem at odds with the Tanglewood setting. Joshua Bell joined the orchestra for Maurice Ravel’s Tzigane (1924). This concert rhapsody, a virtuosic tour de force for the violinist from the opening cadenza through to the end, combines elements of Hungarian music with fiddle tunes and technique. The first few minutes are a violin solo, and the orchestra is left to sit on stage and look interested until their entrance – or, more realistically, to remain calm in the face of the broadside of flying notes hurtling towards them as the violinist chews up the stage. To question the existence of the music, as an earlier reviewer writing for the London Times did, is to miss the point entirely. Sometimes pyrotechnics are their own justification — especially when the litany of challenges does not interfere with the making of beautiful music. The orchestra kept pace with Bell even as the prestissimo accelerated faster than anybody’s business. Edgar Meyer’s Double Concerto for Violin and Double Bass is the latest collaboration between Meyer and Bell, in a friendship and musical conversation stretching back some 30-odd years. Meyer, writing the violin part in this Double Concerto for Bell, finished the composition three weeks ago. Certainly the work plays to the strengths of both soloists. The concerto is in three movements and runs 18 minutes; formally, it adheres to classical sonata form, with the movements linked by shared musical themes. The first movement Allegro begins with tutti orchestra, then both soloists enter together before diverging down different paths. The musical language recalls that of Boccherini, but more expansive in terms of instrumental range and harmonies. The second movement includes a “composed rubato,” a recurring and conducted accelerando and decelerando as part of the theme (as, to give a random example, in Glazunov’s saxophone concerto). The effect is a play with time, but accomplished so organically it makes perfect musical sense. The third movement starts off in a very classical vein, then Stravinsky enters the hall: five-beat phrasing, percussive rhythms, and more contemporary harmonic language. At times the soloists and the orchestra speak differently, the orchestra remaining classical while the violin and double bass explore 20th-century sounds. The movement and concerto end with the two themes from the first movement, soloists alone providing the final cadence. This work is more technically challenging for the bassist (as, for instance, playing in the instrument’s under-utilized upper register) than for violin and demands tight ensemble playing (especially with quintuple meter and cross-rhythms). There is a good use of orchestration, sparse but beautifully considered (for example, the doubling of bassoon and double bass). Not surprisingly in a double concerto for violin and double bass, there is considerable play between the high and low ends of the sonic spectrum. The work was well received by audience and orchestral musicians alike. From his stage presence and demeanor, Meyer comes across as humble and genuinely nice, pleased as he heard the orchestra realizing his composition and seemingly reluctant to take his well deserved turn in the spotlight. This made the ecstatic applause of the other musicians onstage that much sweeter to observe. I hope this double concerto will have many and frequent hearings. Following intermission, the orchestra returned for Tchaikovsky’s Symphony No. 4 in F minor, op. 36. From the shimmering strings at the opening of the first movement, the orchestra delivered a full-bodied reading. The bassoon solo in this movement, played by Richard Svoboda, was gorgeous; the dancing tune at the end arrived organically, well integrated into the music as a whole. The second movement ended subtly, quickly, and served to set up the Scherzo, with dynamics matching the space (a bit louder than in an enclosed concert hall) and the play between loud and soft, off-beats and shifting melodic voices well realized. The finale conveyed the conflicting themes of this symphony, and the Boston Symphony brought this concert to a full-throated conclusion. Michael Stern is currently in his seventh season as music director of the Kansas City Symphony, where he has overseen its growth and expansion and its move into a new concert hall. Trained at Curtis (after an undergraduate degree in American History from Harvard), Stern is also founding artistic director and principal conductor of IRIS Orchestra (Germantown, Tennessee), known for its virtuosity, programming, and commissions of new American work. He was a fitting choice to lead this concert and premiere. On the podium, his gestures were clear and large, and he successfully embodied, and conveyed, the changing moods and different characters of the music. The orchestra seemed more responsive to him as the concert progressed, and more comfortable when he gave them greater freedom, to which they mostly responded. I would like to see a return engagement, and a longer one, of Michael Stern to Boston. I hope the BSO’s Board of Directors, in their infinite, if concealed wisdom, is considering him for the post of Music Director. Already this position has been vacant too long, and the longer this interregnum,the greater the chafing when a conductor is finally named. Meanwhile music and morale suffer. Shouldn’t the photo caption also identify the bassist? I mean, if we have to be told it’s Joshua Bell, don’t many of us also need to be told it’s Edgar Meyer? Heartily agreed – I too would love to see more of Michael Stern in Boston. Haven’t heard the BSO sounding as good as they did in the Tchaikovsky for quite a while.